Sung dynasty (960-1279) style tea is a challenge. 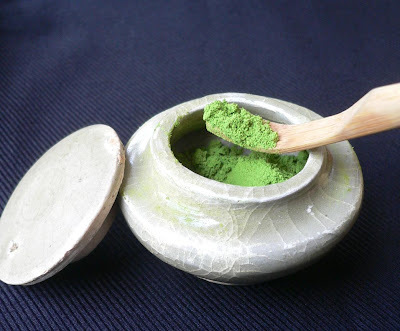 Powder grounded green tea must be whisked in a round, thickly glazed bowl. (The thick glaze helps retain the heat). Controlling your hand's whisking movements for several minutes is much more difficult than controlling the pour of boiling water in a teapot. If the hand is too slow and no froth appears, too fast and the bubbles become too big or even disappear. Concentration, discipline and experience are key. 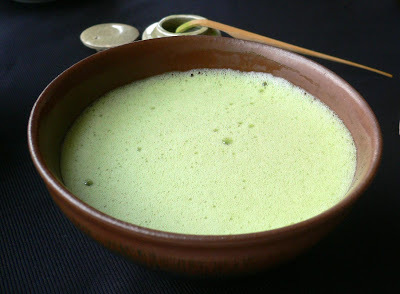 No wonder this tea (matcha) became such a hit in Japan that most tea drinkers don't see it as a Chinese tea style anymore. Last year, I reported that some of the powder didn't dissolve completely, despite my forceful whisking. 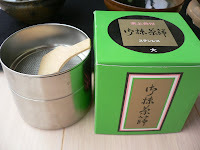 A very kind reader sent me this matcha sifter ('furui') to help solve this problem. (Thank you so much again Kim). Let's see if this unclogged tea powder can make a difference. For my Cha Xi, I use the dark side of my Cha Bu. Black is beautiful and Chinese rulers a thousand years ago already had a very modern sense of style. 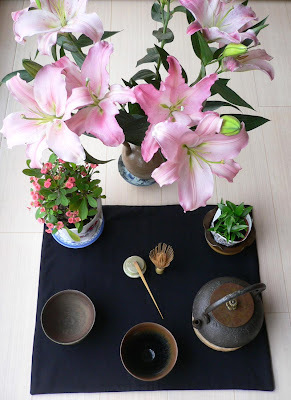 As I long for spring, I gathered several plants and flowers around this Cha Xi. I practiced twice last night. Today, I still struggle to keep my hand steady. I can feel how a very structured process can help to calm down and focus to get the movement right. My mind wanders easily. Slow, fast, switching from using the arm to using the wrist. It's difficult to be steady. Ahh! At least I know I have much room for improvement! And I promise myself that I will continue to practice in the coming days. The dark bowl is now full of green light. It has a unique delicate, fresh and thick taste. Spring is coming. I can see, smell and taste it. The sieving helped. 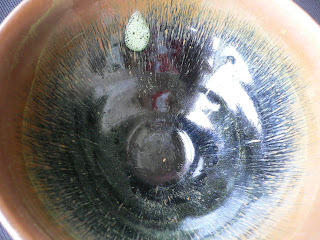 No tea powder was left at the bottom of the bowl as I drank the last drop. I also felt the tea was finer. Still, the whisking technique remains essential to dissolve all the tea in the water. 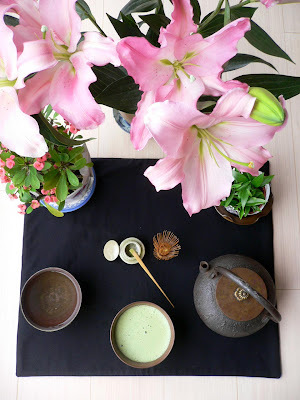 I very much regret that I have not yet experimented with Matcha Teas, you give a great example and tutorial (I would say) on your trial and error regarding this, I absolutely love it!! I hope to do some sort of activity regarding this in the future. Wow I never knew there was so much more to a cup of tea! quelle belle mousse onctueuse ... difficile à obtenir avec pas mal d'eau...enfin pour moi ! et c'est vrai que dans 1 bol sombre, la vert ressort si bien ! Merci Ginkgo. Qui aime bien son matcha le fouette bien! And again 1000 thanks to Kim! I'd even say that 'gong fu tea' takes all its meaning with this tea style. Without practice and skills, you won't get a good result. It won't happen by accident.